Across the Avenida de Amizade, a sprawling theme park called Fisherman's Wharf is going up; the neon lights from the Sands illuminate such park features as an artificial 130-foot volcano that rises above a replica of the Roman Colosseum. Just a few blocks away, construction has begun on the Las Vegas tycoon Steve Wynn's $700 million hotel and casino project, the Wynn Macao, which is scheduled to open in 2006. 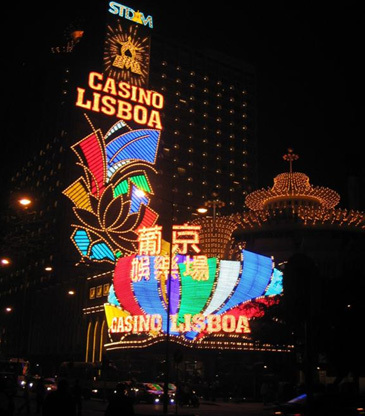 In addition, Macao is awaiting the opening of a MGM Grand Paradise hotel and casino, and Stanley Ho, whose name has long been synonymous with gambling in Macao, is trying to update his own casino empire by building the Grand Lisboa on the Avenida Infante D. Henrique. It's easy to see why Macao, a small island territory 37 miles southwest of Hong Kong, is already being called Asia's Las Vegas. Over the last few years, Las Vegas and Hong Kong entrepreneurs have been promising to transform this tiny former Portuguese colony into the entertainment capital of Asia, full of Vegas style. They have already earmarked billions of dollars to invest in dozens of new hotels, shopping malls, theme parks, convention centers and super-sized casinos. In fact, this year, Macao's casinos could bring in about $6.3 billion by December, and some analysts expect they will surpass the Las Vegas Strip in casino revenues. Such an increase in casino revenues, which were $5.33 billion last year, would represent an increase of nearly 20 percent . "It's the real deal," says Nick Cashmore, an analyst at CLSA Asia-Pacific Markets, which compiled the comparative data. 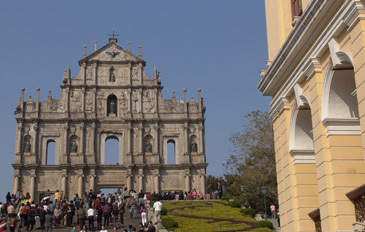 Last year, a record 16.7 million people visited Macao. This year, tourism officials are forecasting close to 20 million visitors. But there are some problems. 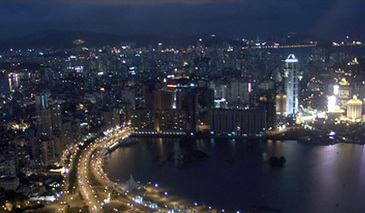 Macao has about 10 square miles of land for 470,000 people. And about four square miles of that land was reclaimed from the sea over the past few decades. 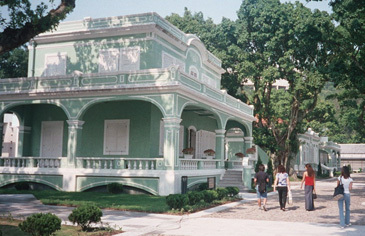 Though Macao has some beautiful old neighborhoods - in fact, in early July, Macao was added to the World Heritage List - it has found it hard to attract visitors with more than gambling on their agenda. Most people just come for the day, traveling by car or bus from the neighboring Guangdong Province through a tunnel that connects the Chinese mainland to the Macao peninsula. Those who stay overnight tend to skip the few five-star hotels on the island in favor of more modest accommodations. The creation of the Cotai Strip - named after the islands Coloane and Taipa - opens up a second front for gambling and entertainment in Macao, several miles away from the casinos downtown. The Las Vegas Sands Corporation alone plans to invest about $4 billion to build a group of hotels and condominiums on the Cotai Strip centered on the Venetian Macau, which Mr. Adelson says will be one of the world's largest buildings, a 10.5 million-square-foot hotel, casino, shopping mall and entertainment complex. Mr. Wynn and Kirk Kerkorian - two other Las Vegas entrepreneurs - also have ambitious plans for Macao. And Mr. Ho, one of the richest men in Asia, is under pressure to upgrade his casino holdings aggressively in hopes of keeping pace with his new, flashy competitors from Las Vegas. He has hired the French architect Paul Andreu to design the boat-shaped Oceanus, a $780 million office tower, "six-star hotel," casino and entertainment complex that is planned for what is now a Macao ferry terminal. He is also teaming up with Kerry Packer, Australia's richest man, to build a $1 billion City of Dreams along the Cotai Strip. The pair are promising a resort that "will appear to float above a crystal lake" and even feature an "underwater casino." 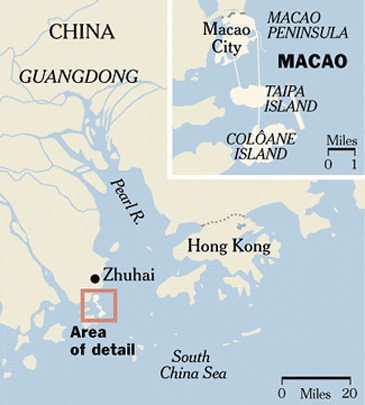 Two companies run ferries between Hong Kong and Macao. Turbo Jet ferries depart from the Hong Kong Macao Ferry Terminal, Sheung Wan, the Hong Kong China Ferry Terminal in Kowloon and Cross Boundary Passenger Ferry Terminal at Hong Kong International Airport. A one-way trip starts at about $24, at 7.6 Hong Kong dollars to the United States dollar. Tickets and information: (852) 2921 6688; www.turbojetseaexpress.com.hk. New World First Ferry, (852) 2131 8181, www.nwff.com.hk, runs from the Hong Kong China Ferry Terminal. Fares start at about $18.